The Institute was founded in August 1993 by Arthur Middleton Hughes and Helena Hughes, as a way of teaching the principles of Database Marketing to American corporate marketers. It began with a with a series of five two day seminars given at York University in Toronto Canada over a two year period. 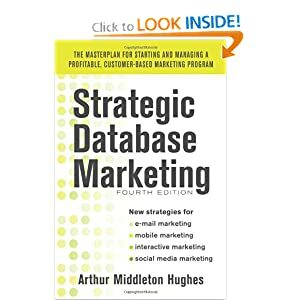 The initial seminars were based on the book Strategic Database Marketing by Arthur Hughes. The seminars each of which were given to between 40 and 55 marketing executives in Canada were experimental. The idea was to encapsulate into two days all the concepts of database marketing as it existed in 1993, and to present this information in a way that it could be used by the participants in their daily work in Canadian industries. In the beginning, there was a lot to be learned. Many of the Canadian marketing executives provided case studies from their work. Some of the class exercises were too complicated. They had to be simplified and made more relevant to actual daily marketing promotions. The final result was a truly useful product that could be launched in the US. The Institute began holding seminars in Washington DC and San Francisco with Dr. Paul Wang and, Mark Peck and Arthur Hughes. Two were held in 1994, four in 1995 and about four to six per year until 2000. The seminars were limited to 49 marketers per session. The seminars filled up fast. Those beyond 49 were put on a waiting list. At each session, Paul and Arthur learned almost as much from the attendees as the participants learned from them. Most of the sessions were business to consumer. There were a few that concentrated on Business to Business. One seminar was held in Toronto, two in Winnipeg, one in Vancouver, one in Taiwan and one in Caracas, five in Sao Paulo, five in Australia, two in Lisbon and one in Kuala Lumpur plus 24 in the US. During the sessions, it was obvious that participants did not have software that would permit them to do RFM analysis. Accordingly, the Institute had RFM for Windows written and given on disk to attendees. This software went through many revisions from 1.0 to 2.0. It is presently at release 4.2. It has been purchased by companies throughout the world. Some current users include American Airlines, Harrahs Casinos, Styles Checks, etc. The Institute registers marketers daily from all over the world, who come to the site to read the articles, buy the books, download the software and excel charts. In a typical week there are more than 100 marketers who register with their name, address, phone and email from every continent and all parts of the US and Canada. The Institute has provided consulting services and individual in house seminars for scores of companies in the US, Canada, Japan, Australia, and Brazil. Among those consulting and educational assignments were Dentsu (Japan), Unisys, Hewlett Packard, Bell Atlantic, Cable and Wireless, Toppan Printing Company, Canada Post, USPS, TeleCel (Portugal), MasterCard International, CitiBank and others.